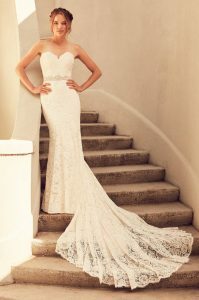 We are really excited to show you style 4797 a really exciting Paloma Blanca Lace Wedding Dress which has just arrived in the boutique this week! A gorgeous sweetheart Paloma lace gown with scalloping around neckline. It features a removable Mokuba Ribbon with beaded appliqué on belt. Fit and flare lace skirt with scalloped hem. We are in love!